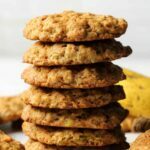 Vegan banana oatmeal cookies that are soft and chewy and packed with banana flavor. These cookies are simple and ideal for either breakfast or dessert. Add the vegan butter and brown and white sugar to the bowl of an electric mixer and cream them together. Add in the vanilla extract and mashed banana and mix in. Then add the flour, rolled oats, cornstarch, baking powder, baking soda, salt, cinnamon and cloves and mix in with the wet ingredients by hand (use a spoon, I just mean not to use the electric mixer for this part). The batter will be quite wet. Scoop it out using a cookie scoop in roughly 2 Tbsp sized scoops onto a parchment lined baking tray. Flatten the cookies with a fork. Allow to cool and firm up on the tray before moving. *Weigh your mashed banana, flour and rolled oats for the best results in this recipe.